Blogging is fun!!! Okay, in all honesty, I never felt it was on first month as a blogger. Those were the lonely days when I felt like my only reader was my dear husband, the dreary days when the comment box was empty, the crazy days when it seemed like I was just talking to myself online! The Blog World became amazing when I started to interact with fellow bloggers. It was when I realized that I was never alone! There are people who are walking with me in the same path with the same goal. One of them is Brennan, the blogger behind www.baktincorporation.com. He has been blogging since 2006 about his travels, food trips, favorite books and perspectives. He is an inspiration to the newbies, like me, in the Blogosphere. In fact, he is nominated for Best Cebu Blogs Awards 2013 (vote for him here). Every now and then, Brennan collaborates with a blogger for his 7-Questions series. They would casually answer seven frequently asked questions about a certain place! So, when Brennan asked me to work with him on his "Dubai in 7 Questions" post, I was really thrilled since this would be of great help to future travelers. Lady Anne: Dubai is one-of-a-kind. It is cosmopolitan and traditional at the same time! You’ll get to see awesome modern architecture; the tallest tower in the world, a sail-shaped 7-star hotel, a palm-shaped island and more unique man-made structures. You’ll also get to feel the culture and the classic vibe when you visit the historical sites at Old Dubai. Brennan: If you have a fascination for superlatives, Dubai should be your next destination. In fact, the Guinness World Records recently established an office in Dubai just to address the ‘exceptional growth in record-breaking across the region.’ Yet amidst the infrastructure and economic boom, this city does not forget its rich cultural heritage. How do you get there and how do you get around the city? Lady Anne: Most airlines have flights and routes to Dubai. So, wherever you are, Dubai is just one or two airplane rides away! Dubai is a tourist hub. It is easy to get around as the transportation system is well laid out. 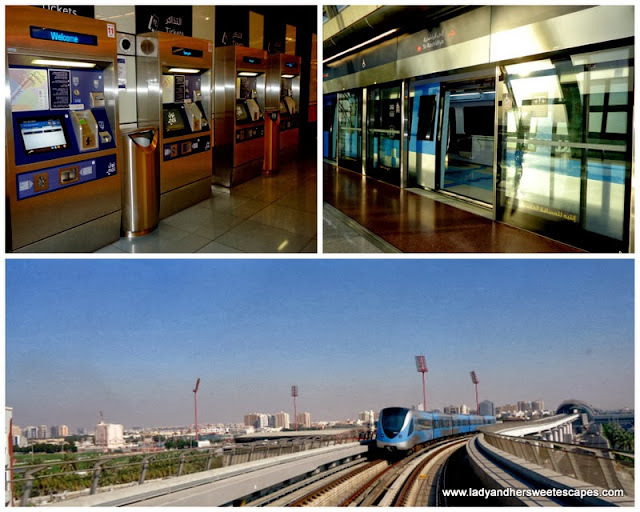 The Dubai Metro is the cheapest and the most efficient way to see the city. The two train lines run along the main tourist attractions. For places away from the city center, you can take a bus or a cab. Brennan: Hop on a Big Bus Tours double decker bus that takes you around the city’s touristy landmarks. But if you have plenty of time to prepare for this trip, go DIY. With the right combination of bus-train-cab and some walk, you can enjoy Dubai’s famous landmarks at a fraction of the cost. 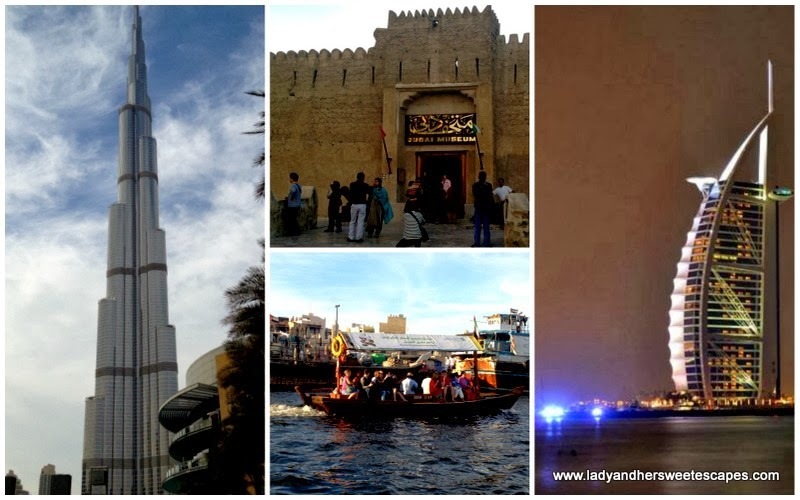 Lady Anne: Dubai offers various activities, from cheap thrills to lavish treats! Dubai may be a fancy city, but it is definitely possible to have fun without spending a fortune. For those who are on a budget, you can see an astonishing musical fountain show at The Dubai Fountain, watch the marine life at Dubai Aquarium (Guinness World Record’s largest acrylic panel) and have photo ops at the foot of Burj Khalifa and at the beach near Burj Al Arab for free. 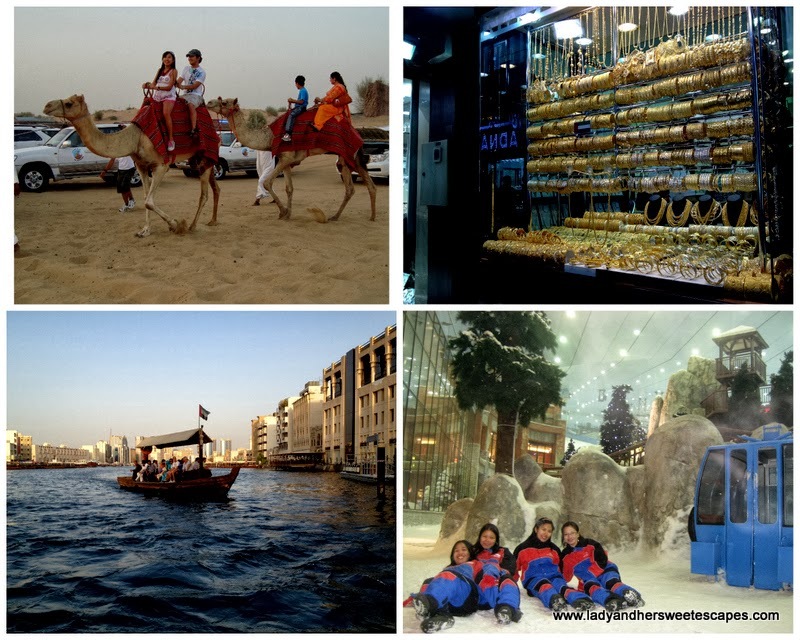 You can also enjoy the Old Dubai by visiting the different kind of Souks, riding the Abra (traditional wooden boat) at Dubai Creek for only 1 AED and having a glimpse of the city’s history at Dubai Museum for less than 5 AED. If budget is out of the picture, you can make the most out of your stay by going on a desert adventure; Desert Safari is a fun and thrilling experience. You can also play in the snow at Ski Dubai and frolic in waterparks (Wild Wadi and Atlantis Aquaventure). A precious piece of jewelry from the Gold Souk is a common souvenir for most tourists. Brennan: Lady Anne has enumerated what should definitely be in a ‘Dubai checklist.’ You can add to that ‘mall hopping’ too: the Dubai Mall, Mall of the Emirates and the Ibn Battuta Mall. Just a word of caution though. There’s no way you can do this in just one day as each of these malls are massive and grand in their own right. Lady Anne: Whenever my friends come for a visit, I always tell them to choose a hotel near the Metro Station as it could save them a lot of time and energy. London Crown Hotel near BurJuman Station and Flora Creek Hotel Apartments near Deira City Centre Station are usually their top choices. For budget travelers, Dubai Youth Hostel is a popular option. 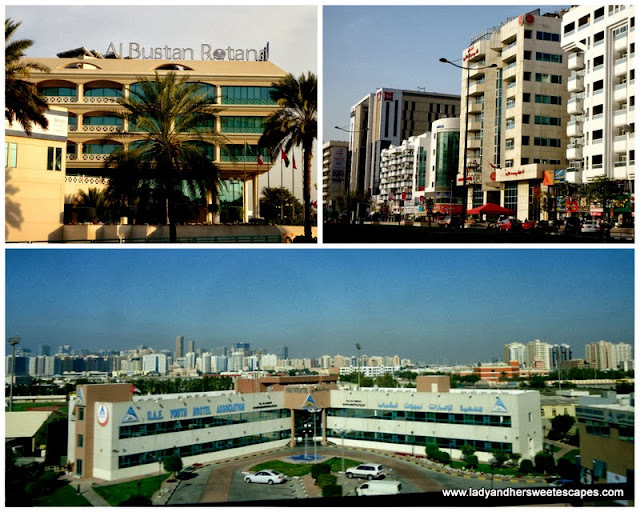 It is where you can spend the night for only 100 AED. Brennan: Back then, I did not stay in a hotel, so thank you for sharing these tips! What food stops should you not miss? Lady Anne: Everyone should have a classic Emirati Meal. Dine at Al Fanar, a local Emirati restaurant in Dubai Festival City that serves traditional dishes like Machboos Deyay and Leqaimat. You can also join the cultural meal at Sheikh Mohammed Center for Cultural Understanding in Bastakiya. Look for Bu Qtair Restaurant when you find yourself at Jumeirah to see the luxurious Burj Al Arab. Many have been raving about this unassuming restaurant for its affordable and delicious fish and shrimp dishes. Try out the Mutton Biryani, Chicken Tikka and other Pakistani delicacies at Ravi Darbar Restaurant. Finish off the meal with a Mango Lassi or a Gulab Jamun. Dare to eat a camel burger. I tried one at Local House Coffee Shop located at the Al Bastakiya, a historic district in Dubai. And no, it doesn’t taste like chicken. What would you do differently, next time? 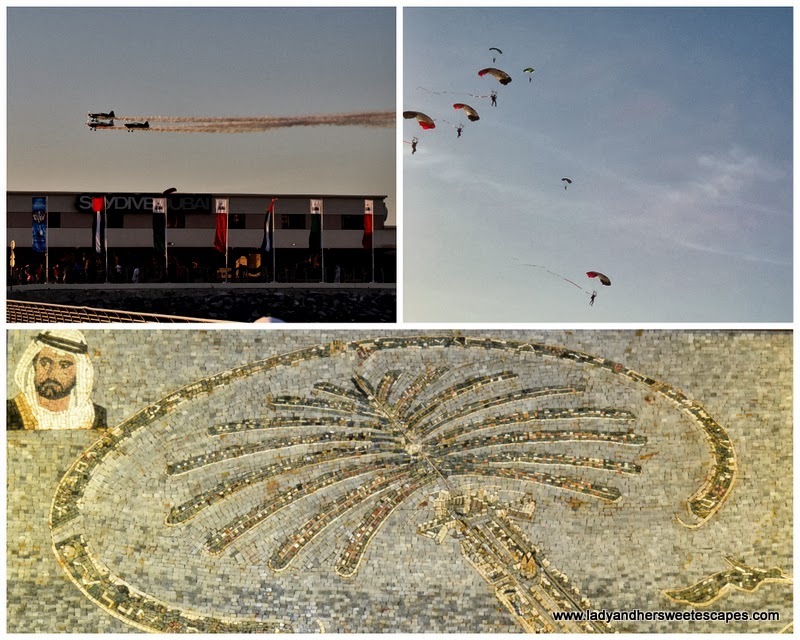 Lady Anne: I have to gather all my guts and try sky diving above Palm Jumeirah. Anyhow, I live and work here, so I still have so much time to try out all the things that Dubai can offer. Brennan: I'd like to visit an authentic Emirati restaurant. 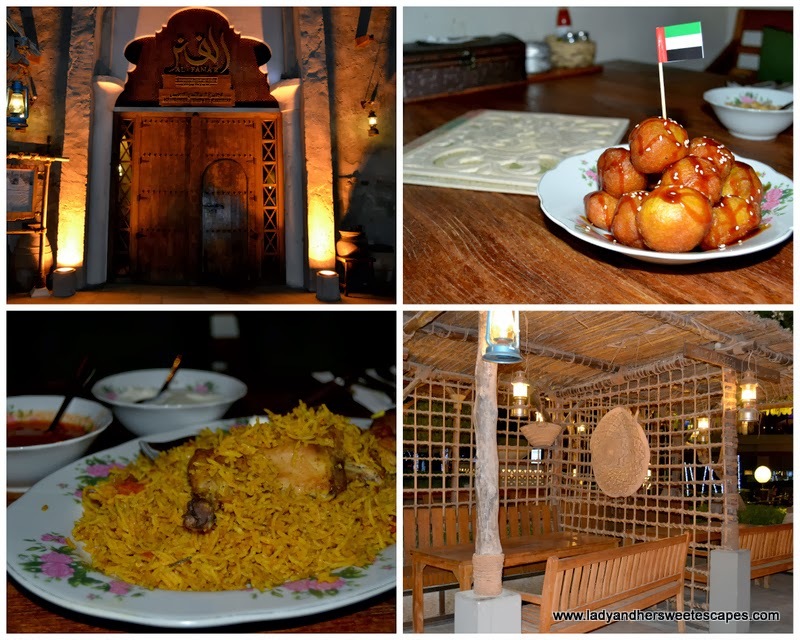 It is said that restaurants like Al Fanar, as Lady Anne suggested earlier, are hard to come by in Dubai because of its growing and diverse expatriate population, who also bring in their cuisine in the picture. Lady Anne: I give it a 9/10! Dubai has been my second home for five years already. I’m loving every step of my journey as an Expatriate in this amazing city! Bren: Same here Lady Anne. It’s a 9 for me. Dubai is not just a city that seems obsessed with Guinness World Records. It is a destination teeming with life and endless possibilities. Thank you Lady Anne for the collaboration! Your photos look stunning by the way. interesting interview and introduction to Dubai. I haven't been to Dubai before and it seems like a fun place to visit. Those foods surely catch my eyes, nice tips and info you got there. It sure is useful for Dubai visitors. This gives a good perspective of what to expect in Dubai. Like Meikah I really want to visit Dubai.. and experience everything Dubai can offer.. 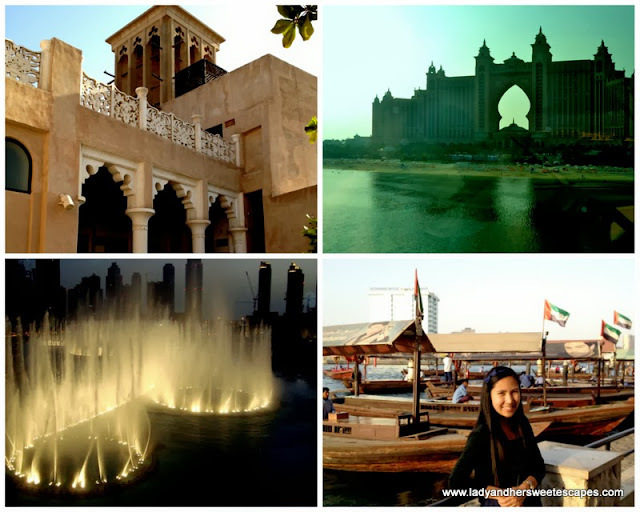 Thanks for sharing interesting facts about Dubai. At first, I really thought that is was just a desert..Hindi pala...there are many tourist destinations din naman pala around Dubai.